As Momina made her debut in the Coke Studio she is in the limelight. Where many individuals feel that she is very beautiful, one individual feels that she looks like… a ‘maid’. The issue is not that Momina was targeted like this, the real problem lies that what kind of society are we turning into? Completely inhuman, so indecent that the servant which work at our home for hours and make our life easier we tag them as demeaning “kaam waali massi or Maid”. It should be understood it’s a maid or a GM in a company they all belong to the working group of our society who get paid for the work they do! Another issue which is too important to be noticed is, that what are we using social media for? Increasing our knowledge, intellect? Getting entertained? For work? Or just for INSULTING others? It is a high time to realize that when one is making comments on social media he/she is depicting his/her own mentality and not causing much harm to the other person. Same goes for Momina. 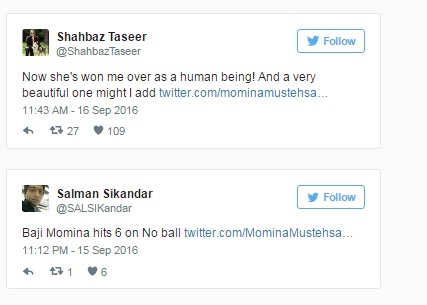 Her response increased her number of admirers including Shahbaz Taseer.